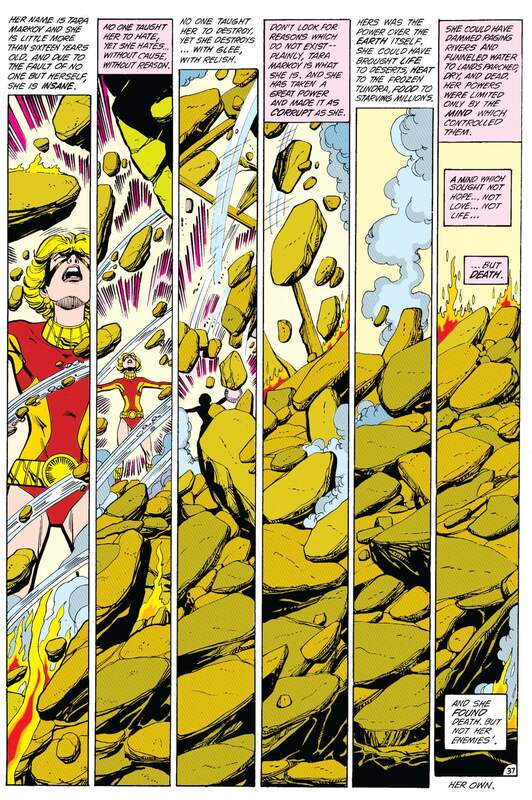 Readers first met Terra in The New Teen Titans #26 (written by Marv Wolfman and penciled by George Perez), when she attempted to destroy the Statue of Liberty using her terrain-based powers. Gar Logan (who called himself Changeling during this era), came to stop her, causing the young girl to panic. 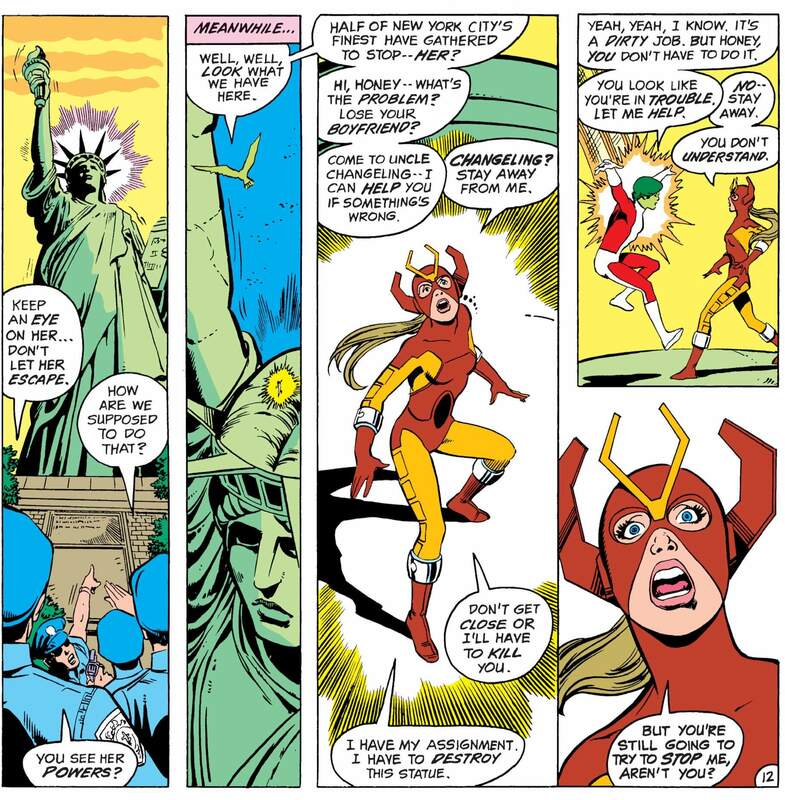 Terra ultimately got away and the Statue of Liberty remained intact, but Gar had a feeling there was more to her than met the eye. He thought she was acting under duress and couldn’t help but wonder if she was in some sort of trouble. The Teen Titans finally caught up with Terra in The New Teen Titans #28, and the young girl tearfully poured her heart out. It was revealed her name was Tara Markov, and that she was the illegitimate child of a European king (later identified as Markovia). She told the Titans that terrorists were holding her parents captive and forcing her to commit crimes in exchange for their safety. The Teen Titans helped Terra strike back against her captors, but the terrorists told Terra that her parents had been dead the whole time. The Titans comforted the distraught girl, with Gar feeling especially protective towards her. In The New Teen Titans #30, Tara shows Gar her new costume, claiming she sewed it herself, and petitions for membership with the Titans. The group allows her to join, but they remain cautious around her. They don’t reveal their secret identities to her, which causes Terra much frustration. Although the group seems to trust her, they can’t help but notice some inconsistencies in her backstory. Why didn’t she use her powers to escape from her captors? How did she keep her own apartment if she was a prisoner? When Tara was pressed to answer these questions, she grew resentful and the Titans wound up dropping it. Changeling remained very defensive of Tara, and began developing romantic feelings for her. 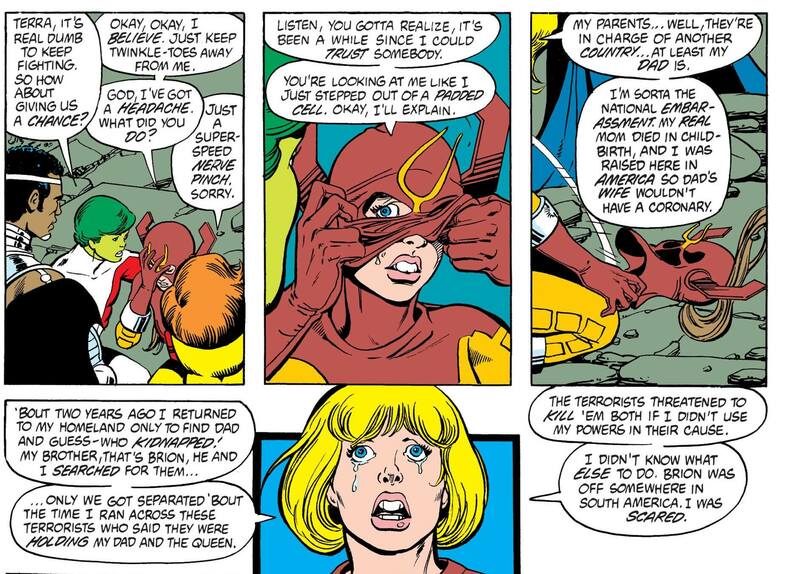 Tired of being treated like a second-class citizen, Terra rushed off to face Deathstroke alone in The New Teen Titans #34 (written by Marv Wolfman and penciled by George Perez). Although Terra was able to hold her own until her teammates arrived, Deathstroke got away. Nonetheless, the group was impressed with Terra’s performance and decided she had earned their trust. At the end of the issue, Tara and Deathstroke meet up at her old apartment in Brooklyn. It turns out they had been working together this entire time. Even the terrorists who pretended to capture Terra were a part of the act. Everything was all part of a larger scheme to infiltrate the Titans. Terra continued spying on the Teen Titans for Slade, who she had become romantically involved with despite their age difference. In The New Teen Titans #37 ,Tara and her brother Brion reunited during a team-up between the Teen Titans and Batman’s Outsiders. Brion was now operating as the superhero Geo-Force, with his own costume much like Terra’s. While the reunion was a happy one, it did raise more questions as Brion’s story contradicted things Tara had told them. The Teen Titans dismissed the red flags as Tara merely being protective and continued to allow her into their inner circle. The group finally revealed their secret identities to her, and Donna Troy even invited Tara to be a bridesmaid at her upcoming wedding. To help sell the deception, Tara allowed Gar to kiss her. Now that she had the Titans where she wanted them, it was time to strike. In The New Teen Titans #43, Deathstroke finally acted on the intel Terra had given him and captured the Titans. Slade took the group to H.I.V.E.’s headquarters, where Terra gleefully revealed her betrayal to her former teammates in Tales of the Teen Titans Annual #3. The group was shocked and hurt to discover her true nature, but none as much as Gar. He couldn’t believe Tara had really deceived them for so long and tried to convince himself that she was being mind-controlled. When the Teen Titans broke free and battled their way through H.I.V.E. headquarters, Terra grew more agitated. Unlike Slade, she wasn’t in it for the money or honor, she just wanted to destroy the Titans because she was driven by hate. When Jericho used his body-jumping powers to control Slade’s movements, Terra thought her lover and ally had betrayed her and something snapped. Her insanity grew and she began attacking everyone regardless of whose side they were on. Terra became a victim of her own madness when her out-of-control powers summoned a storm of boulders that crushed her to death. The Teen Titans kept Tara’s true nature from the public and gave her a hero’s funeral. Gar of course took Terra’s death the hardest, and blamed Deathstroke for corrupting her -- until he discovered that Tara always had hatred in her heart. 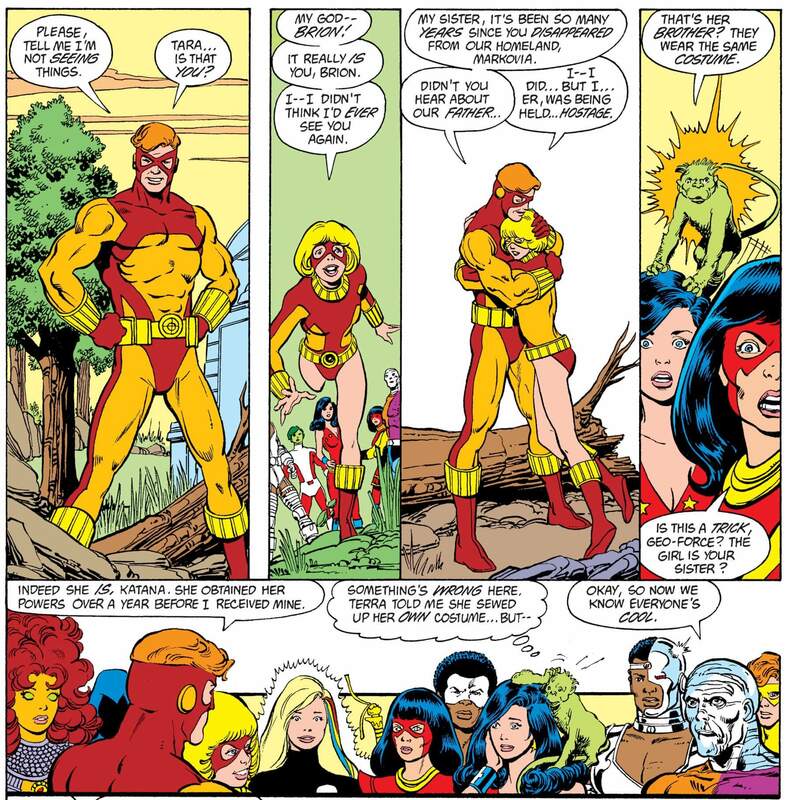 Initially Geo-Force thought his sister had died a hero, but when he learned of her true nature, he could no longer bear to wear his original costume since it was so similar to hers. 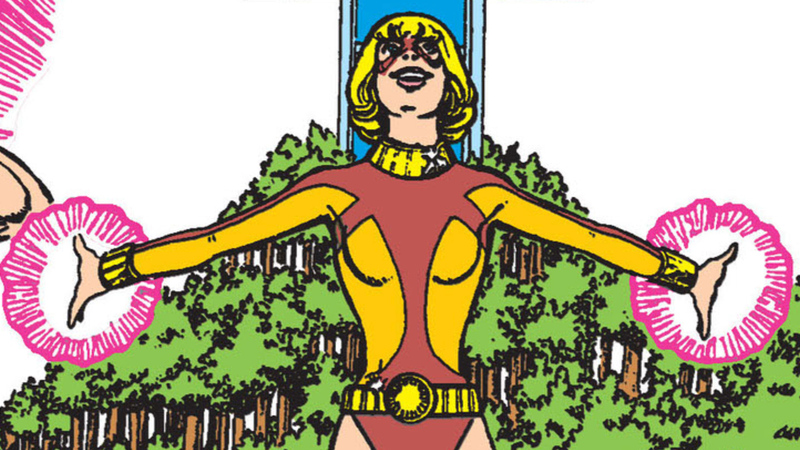 Years after Terra had died, a lookalike showed up in New Titans #79 (written by Marv Wolfman, penciled by Tom Grummett, Paris Cullins and Curt Swan). Her appearance confused the Titans, especially Changeling who still had emotional scars from Terra’s death. It turned out that Terra II was part of a time-traveling group called the Team Titans. Terra II believed she was the victim of a futuristic genetic virus that transformed her into a lookalike of the first Terra. 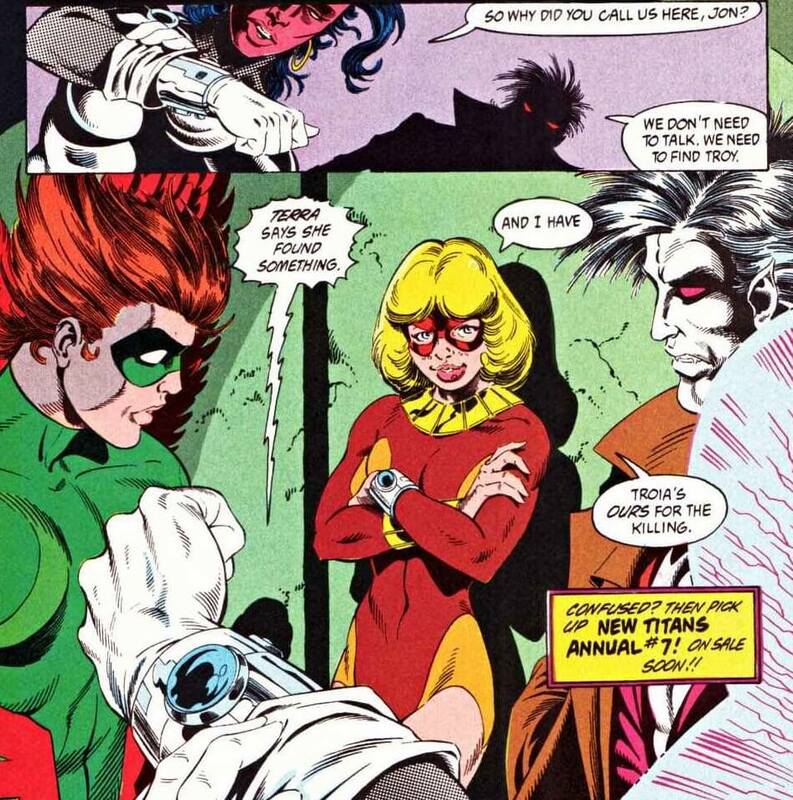 Like her predecessor, she was placed in the Team Titans as a spy, but unlike the original Terra, she wound up rejecting her employer and helping the team. When the reality-altering events of 1994's Zero Hour event wiped the Team Titans out of existence, Terra II remained. It turned out that her memories of being from the future were false. Unsure of who she was and where she came from, Terra II joined Arsenal’s group of Titans while she worked through her identity crisis. Tera II did her best to carry on, but not knowing her true origins was a heavy weight to carry. Her confusion only grew when she discovered that the original Terra’s grave was now empty. For a time, Terra II had avoided Geo-Force but eventually allowed herself to meet him. She told Brion that she could never be his lost sister, but she’d like to be his friend. The two grew close and leaned on one another for emotional support. In Titans Secret Files and Origins #2, Geo-Force and Tera II conduct a DNA test to determine once and for all if she is truly the resurrected version of Terra Markov. Sensing that Tera II wants a clean slate, Brion lies to her and tells her she and Tara are not a match. Tera II is overjoyed at the news, no longer fearful of being the psychotic traitor Brion’s sister was. Terra II later joined a new group of Titans led by Beast Boy. In 1999's World War III limited series (written by John Ostrander and penciled by Tom Derenick) the villainous Black Adam went on a murderous rampage around the globe in retaliation for the death of his family. The Titans attempted to stop him, but Terra II was brutally murdered when Black Adam tore through her body. Although Tera II died without ever knowing her true origins, unlike her predecessor she fell in battle defending her friends. A new Terra was introduced in 2007's Supergirl #12 (written by Jimmy Palmiotti and Justin Gray, penciled by Amanda Conner). This Terra helped Supergirl defeat a giant monster but seemed reluctant to reveal her name or true origins. 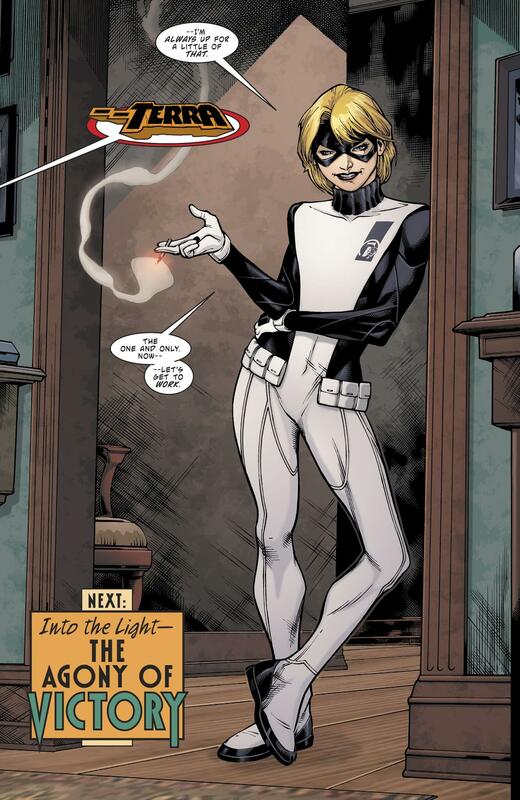 Her backstory was finally uncovered in the 2009 limited series Terra (written by Jimmy Palmiotti and Justin Gray, penciled by Amanda Conner). This third Terra was a girl named Atlee who came from an underground colony called Strata. The Stratans had chosen Atlee to be their protector and sent her up to Earth. During this mini-series, it was revealed that Strata’s previous protector was Tera II. Tera II was another Stratan, and she had been genetically mutated to look like Tara Markov in the hopes that it would help the surface dwellers feel more at ease with her. The genetic modifications caused Terra II’s amnesia. When Geo-Force was injured in battle, Atlee took him to Strata and told him the truth about Terra II, giving him the closure he needed and explaining the positive DNA test. Brion then gave Atlee his blessing to continue using the Terra name. After the reality-altering events of 2011's Flashpoint, the original Terra showed up alive and with a new history in 2011's Superboy #8 (written by Scott Lobdell and Tom Defalco, penciled by R.B. Silva and Iban Coello). Here Terra, along with Beast Boy and other super-powered teens, was held prisoner in a place called the Colony. After escaping, they called themselves the Ravagers, stuck together, and operated as a team. During their time together on the Ravagers, Tara and Gar’s feelings for one another grew and they eventually become a couple. The two later went their separate ways, with Gar believing that Tara had died in a battle with Deathstroke. Following the events of 2016's DC Universe: Rebirth #1, Terra was seen working with Slade as part of his Defiance team. 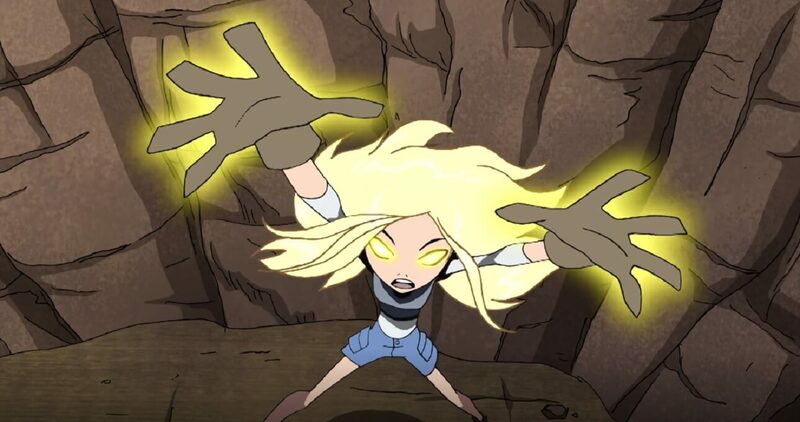 Terra played a significant role in the second season of TV's Teen Titans animated series. The terrain-based teen was voiced by Ashley Johnson and made her debut in the episode “Terra”. Her story followed a similar path to the comics -- she joined the team, stole Beast Boy’s heart, and then betrayed him and his teammates to Slade. Unlike in the comics, however, the animated version of Terra redeemed herself in the end before becoming encased in stone. 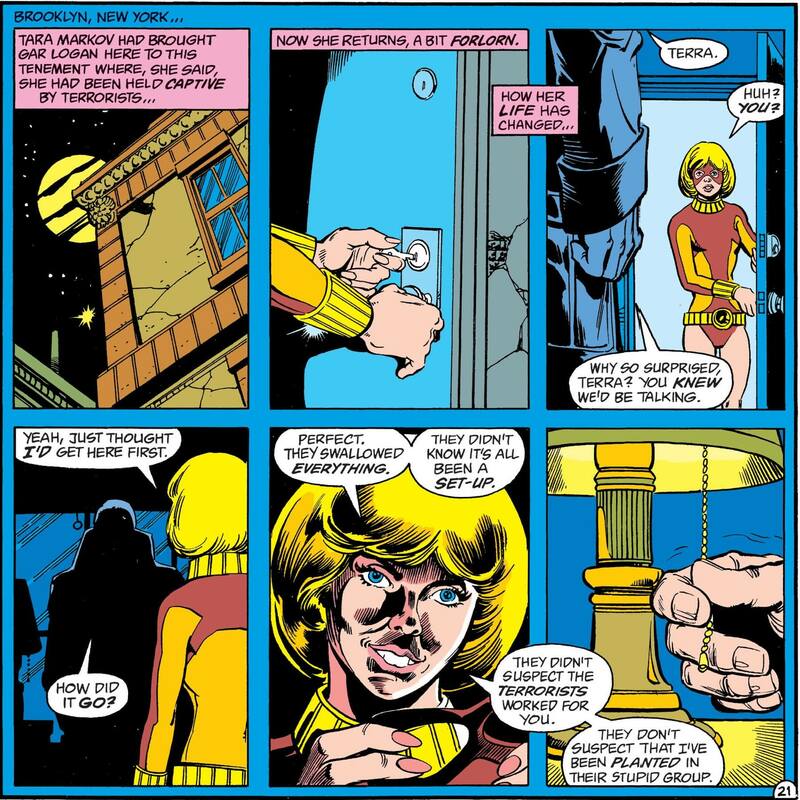 “Things Change”, the final episode of the series, ends on an ambiguous note with Terra’s statue missing and an amnesiac lookalike shown living a quiet life away from the Titans. Ashley Johnson would voice Terra again in the follow-up series Teen Titans GO! Terra is seen in the mid-credits sequence of the animated movie Justice League vs. Teen Titans, and plays a full role in its sequel Teen Titans: The Judas Contract, in which she is voiced by Christina Ricci. The latter film adapts the classic storyline from the 1980s Wolfman/Perez run. Are you a fan of Terra? Let us know in our Community!